Our brief was to design a new house to replace an old one; somewhere for a couple to retire into with their book- and art-collections. At the end of a country lane, the south-facing site has magnificent views over the Black Mountains, Mynydd Epynt and the Brecon Beacons. The kitchen and dining table were to be central to the house. Generous living space and the main bedroom were to be organised on the ground floor to help with mobility in old age. Upstairs, we were asked to provide three bedrooms for visiting family and an office. The project was initially refused planning permission by the local authority and we conducted a successful planning appeal with the Welsh Assembly. The house comprises two principal elements: a run of service rooms built into the slope in concrete and masonry; and a steel- and timber-framed block - pitched-roofed, slate-hung and shelf-lined - containing the main living spaces. These are joined by a north-lit picture gallery. The gallery is open to the principal rooms at ground floor, and is designed to play with insideness and outsideness. At the entrance, the pitched roof extends beyond the walls to form a canopy, framed in steel. The underside of this canopy is lined with red-stained ply, with oculi - circular openings - open to the sky. This space has three uses: it celebrates arrival, allows for summer dining facing the setting sun, and provides a sheltered parking space in winter. A glass box would be the obvious modern solution on a site as picturesque as this but too much exposure can be overwhelming on winter nights. Psychological retreat is also important. So the rooms balance feelings of expansiveness and enclosure with carefully judged window openings. Upstairs rooms are sheltered by the pitch of the roof which is brought low. Horizontal windows at floor level and circular rooflights above focus on earth and sky. Downstairs rooms have floor to ceiling windows and horizontal slots recessed into bookshelves. The house is conceived as a series of frames. 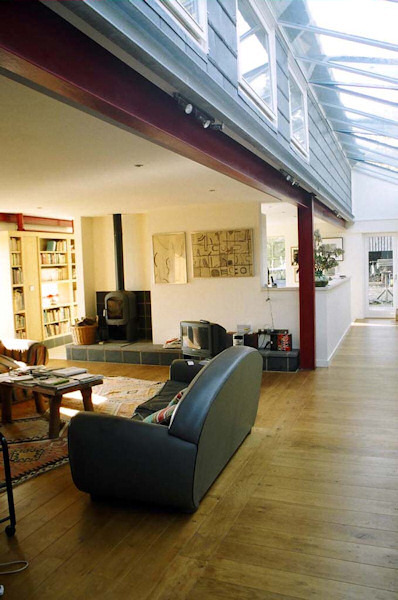 Windows and rooflights have capacity for complex framing; shelves and ledges can frame the things of people's lives; and seats, built-in or loose, and doorways, can frame the human frame. A building in a landscape, perhaps more so than in a city, can also operate as a frame of sorts; its presence punctuating the continuity of its surroundings, drawing attention to both the building and its context. Llethr's sequence of experience was choreographed around frames. Windows are fixed to the outer face of the wall; an opportunity to maximise reveal thickness and paint more teasing pictures of the interior. The galvanised steels of the entrance canopy frame the door and capture slices of sky; the two circular oculi here explicitly draw attention to the clouds and, on bright days, cast the sun's rays as a stretching disc on the wall: another sort of frame. Housemartins now nest under the eaves here, and bats live in nearby trees, and these circular holes frame the birds that fly through them. Just as the exterior was conceived in terms of frames, so the interior is measured out with them. Fitted bookshelves, with windows inset and between, count-out the sizes of downstairs rooms. These oak trimmed ply caskets, frames themselves, show the books and personal things that describe the clients' lives. Llethr has a forty-five degree pitched roof: a totem of houseness and a practical move in this exposed spot. The main elevation is banded horizontally, belonging as much with the fenêtres en longeur of architectural modernism as the horizontal emphasis of the human marks - walls and hedgerows - which characterise the surrounding landscape. The house's primary steel frame - its bracing members expressed as galvanised channels on the face of the elevation - recall both contemporary kit-built barns and gothic string courses. There are hints too of a grander houseness; the overhanging entrance canopy imagined as part porte cochére as well as part cowshed. Perhaps the most evocative design choice externally is the building's slate-hanging. Weather comes from the south-west here and older local houses have a slate hung west elevation to mitigate the worst of the wind-driven rain. Slate is talismanic of Welshness but it also speaks of domesticity, belonging with many a UK roof, Welsh or otherwise; part of the image of houses as diverse as Victorian terraces, arts-and-crafts villas and developer-led suburbia. Here the slate system used is edged with metal clips like a zip fastener, recalling that icon of modernity as much as it does the terrace or villa. 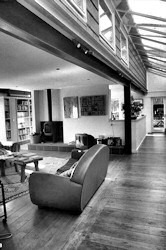 The house hints at older characteristics of houseness with its pitched roof and timber bookshelves, but it also knows its place in a contemporary society where horizontal windows and steel are as familiar as older forms, where materials and subcontractors are sourced through international organisations, where internet, transport and mass media have wide reach, and where the immediate landscape is also a global one. Sustainable technologies are employed at Llethr. While some water is supplied from a well on the hillside, additional mains water and mains electricity are supplied. Passive devices for optimising natural heat, and a wood burning stove, are topped-up by oil fired central heating including underfloor heating in principal rooms. Active devices are also provided: solar water heating, containment to allow later addition of photovoltaic cells, and a heat recovery system which re-circulates air between rooms to regularise temperatures and minimise heat input. These devices - especially the heat recovery system - raise questions about 'sustainable technologies'. This idea is often understood, somewhat perversely, as the making of energy-consuming devices which reduce the energy consumption of other devices; an idea in contrast to passive design which aims to reduce the need for devices of any sort. At Llethr, close attention was paid to the path of sun and shadow, the touch of warm reradiating surfaces, the awareness of warm air rising, and the sheltering feel of thermally massive construction. Such devices allow people opportunities to perceive the world around them, to engage and participate in its motions. And from this engagement, potentially, comes a sense of proximity to the things and phenomena of the world, rather than distance. Sustainable buildings and technologies have the responsibility to involve people. At best, they have a pedagogical role, toward a broader aim of inclusivity and participation. Sustainable technologies: heat recovery, solar hot water heating, photovoltaics. And the role of sustainable technology in making good places for living. Framing: strategies for curating views in, through, and out to make the best use of the landscape and the client's art and books. "It is certainly one of those rare pieces of house architecture where exterior and interior with all the furnishing and fittings plus artworks feel utterly comfortable together, and that comes from Sharr's intimate listening to, and understanding of, his clients, and working outwards from that [...] there is not a single first time visitor to Llethr, according to Mary Elster, of whatever age or class who has not gone away musing how thoroughly splendid and uplifting a proper modern architecture can be. That must count for something and be worth celebrating."